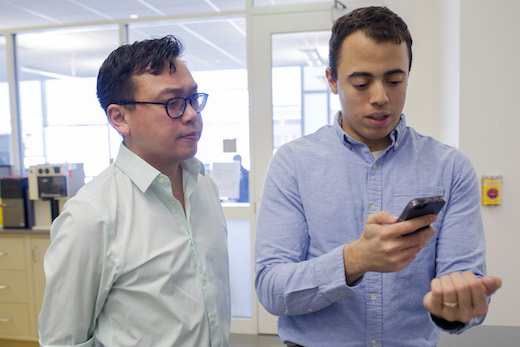 Graduate student Rob Mannino (right), pictured with Wilbur Lam (left) was able to refine and tweak technology for anemia detection by using himself as a test subject. Photo by Christopher Moore, Georgia Tech. The results were published Tuesday, Dec. 4 by Nature Communications. Lam is a clinical hematologist-bioengineer at the Aflac Cancer and Blood Disorders Center of Children’s Healthcare of Atlanta, associate professor of pediatrics at Emory University School of Medicine and a faculty member in the Wallace H. Coulter Department of Biomedical Engineering at Georgia Tech. The researchers were able to show that a single smartphone image, without personalized calibration, can measure hemoglobin level with an accuracy of 2.4 grams/deciliter with a sensitivity of up to 97 percent. Personalized calibration, tested on four patients over the course of several weeks, can improve the accuracy to 0.92 grams/deciliter, a degree of accuracy on par with point-of-care blood-based hemoglobin tests. Normal values are 13.5-17.5 grams/deciliter for males and 12.0-15.5 grams/deciliter for females. Mannino and Lam say they are working with a variety of doctors at Children’s and Emory – geriatric, internal medicine, neonatologists, transfusion medicine, global health – to obtain additional data and better calibrate their system. The smartphone anemia app is projected to be available commercially for public download as soon as Spring of 2019. A patent application has been filed for the anemia app, and Wilbur Lam and Rob Mannino have a financial interest in the success of this product.